23 very well-known people from the arts, sport, and business worlds talk about how dyslexia affected their childhood, how they were able to overcome the challenges and use the special strengths of dyslexia to achieve great success in adulthood. Darcey Bussell CBE, Eddie Izzard, Sir Richard Branson, Meg Mathews, Zoe Wanamaker CBE, Richard Rogers, Benjamin Zephaniah, Steven Naismith, Lynda La Plante CBE, Sir Jackie Stewart OBE, Sophie Conran and others share their stories, and their advice. All reveal the enormous difficulties they faced, the strength required to overcome them, the crucial importance of adult support, and how `the different way the brain is wired' in dyslexia has enabled them to see something different in the world and to use their creativity in an exceptional way. They talk about `thinking sideways', and the ability to look at a bigger picture, the often strong visual strength, and the ability to listen, and to grasp simplicity where other people see only complexity. They also talk about how dyslexia continues to challenge them, and the ways they have found to work around this. An introduction, and final section that includes practical information about dyslexia, are written with the support of Dyslexia Action, and a percentage of profit from the book is going to The British Dyslexia Association. 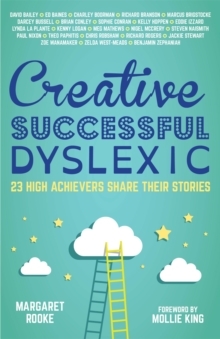 The book will be essential reading for teachers and other professionals, and for families affected by dyslexia, and inspirational for people with dyslexia.